Welcome to the VentureWrench Library and Community! The VentureWrench system is designed to be easy to use, but we’ve included some tips and tricks to help if you need it. and we will get on it right away! 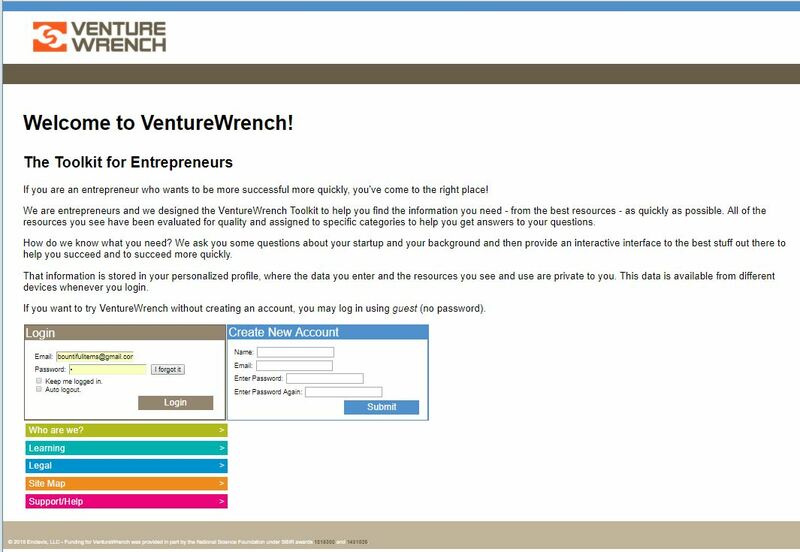 We’ve recorded some quick demo’s of the the VentureWrench Library on different topics so you can get quick peek. Enjoy! create an account to store your customized information or login as guest (type the word guest with no password). 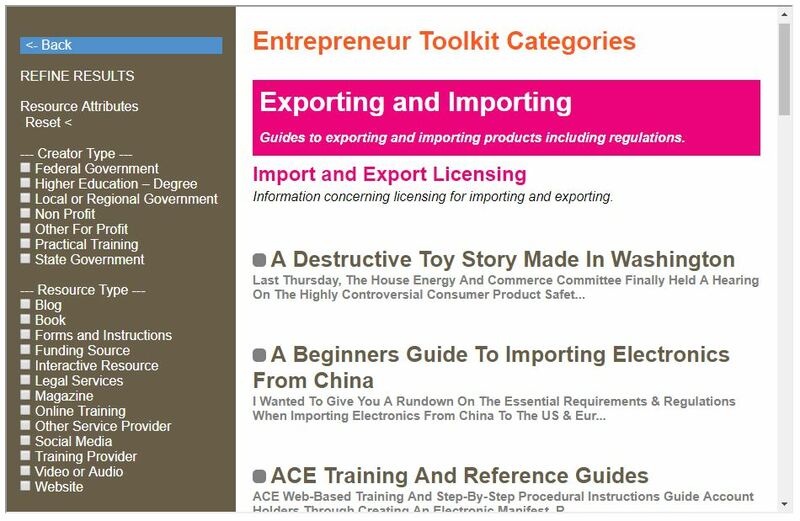 You can access all of our accessory pages as well, starting with “Who are We?” and the link to our “Learning Center” page which includes information about our online courses and value added materials. Of course we include the ever popular, and unfortunately, ever necessary, “Legal” page as well as our “Site Map” if you want to see how things are arranged. Finally you could click again on this page, the Support/Help page! Also, we invite everyone to sign up for our blog StartupNotes at Notes.VentureWrench.com. We blog about once per week on topics to help entrepreneurs so come and be part of the community! 90 sub-topics and these are arranged in 8 action areas, designed to help you navigate the key areas of your business life cycle. Simply scroll down to review the eight action areas and their associated Topics to identify which are most relevant to you. sub-topics under each topic, simply click on the topic area – all of the sub-topics under that action area will appear and you can select the one you are interested in. 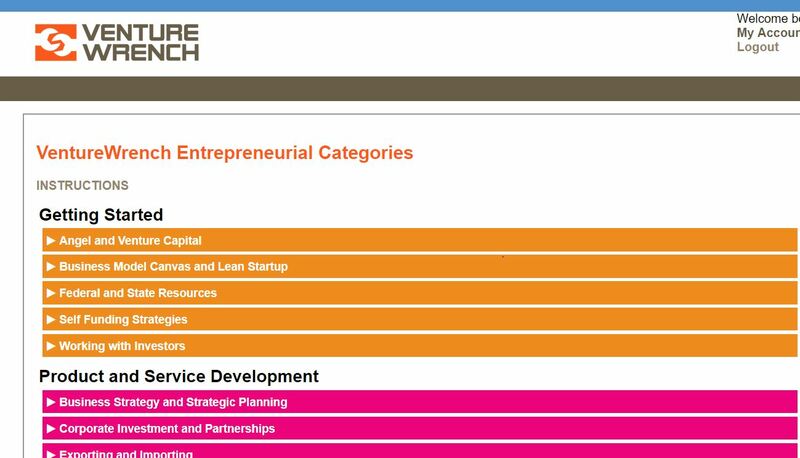 After selecting the topic you want, VentureWrench will then show you the available resources for that topic. Selecting a resource takes you directly to the page of that resource. Don’t forget that you can fine tune the types of resources that you see in the list. Every resource has been curated to include information about the type of organization that created it, such as government or non-profit, as well as the type of resource it is, such as blog, website or audio/video. In addition, you can select if you want resources that are targeted at a certain company type. If you select “High Growth” you will see resources that are targeted to those businesses who expect to raise money from investors. Selecting “Small Business” VentureWrench will show you resources for businesses that are more likely to stay local or family-owned and “Startup” resources are specifically for those that are just getting started. If you leave all of these blank, you will see all available resources in the sub-topic. present to you, click on the menu from the upper right corner. Select the state where your business or headquarters is located and the system will include resources unique to your state and region as well as all national resources. VentureWrench can also include resources specific to the type of business you are pursuing, such as B2B vs consumer businesses. In addition, identifying if you will be pursuing international sales or government contracting provides customized information on those topics. All of this customization is designed to help you get to the resources you need as quickly as possible so you can get moving your business forward!